The results presented in this report come from a year’s worth of research about how American adults use the Internet and how they feel about it. 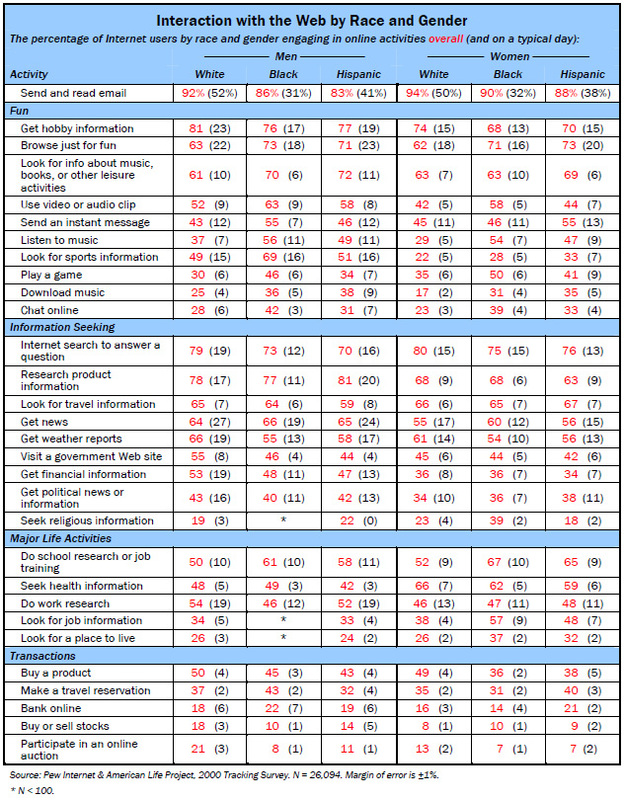 The Pew Internet & American Life Project commissioned phone survey work from Princeton Survey Research Associates that began on March 1, 2000 and has been ongoing most of the time since then. The work presented here focuses entirely on adults 18 and older living in the continental United States (thus, not residents of Alaska and Hawaii). The most current data, including the 50% figure as the size of the Hispanic online population, come from a survey taken between February 1 and February 28, 2001. In that survey, 2,096 American adults were interviewed, of whom 1,198 are Internet users. In that overall sample, 132 Hispanics were interviewed. The analysis about which activities Hispanics perform on the Internet comes from a variety of polls conducted between March 1 and December 22 last year. During that time, the Project’s survey-takers spoke to 26,094 adults, including 1,842 Hispanics. Of those Hispanics, 904 are Internet users. The answers of online Hispanics were compared to answers from non-Hispanic whites and African-Americans to produce our conclusions about how different racial and ethnic groups use the Internet.2] Furthermore, this sample of Hispanics is big enough to give us statistically valid readings to compare how different members of the Hispanic community use the Internet. For instance, we can use it to compare Hispanic women and men and younger and older Hispanics. 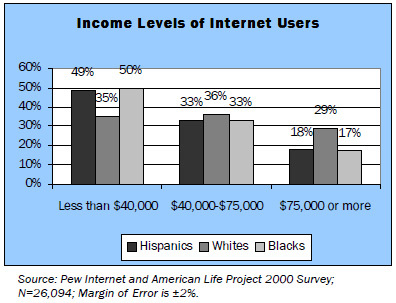 This sample of Hispanic Internet users in 2000 has a margin of error of plus or minus 3 points. We often add batches of questions about a particular Internet topic to our core survey about what people do online. These “modules” of extra questions are usually asked for a month at a time and then dropped from the “core” survey that continued for much of the year in 2000. Several sections of this report contain findings from those “modules,” including a battery of questions about people’s email use that we asked in March 2000 and a battery of questions we asked about people’s privacy concerns that we asked in May and June that year. In this study, the term “Hispanic” is self-defined. While we realize that our respondent pool represents many ethnic and cultural backgrounds, we do not ask those who identify themselves as Hispanic to tell us their country of birth or length of time in the United States. As a result, we are unable to compare responses and behavior based on these characteristics. Our survey work is also conducted entirely in English, and we do not ask respondents to tell us if English or Spanish is their primary language. We often compare online Hispanics to online whites and online blacks in this report. We recognize that Hispanics can be white or black but have used polling techniques that separate them out as a distinct group. Their responses are not included in the responses given by non-Hispanic whites or blacks. Thus the term “Hispanic” means people of all races who call themselves Hispanic. The terms “white” and “African-American” or “black” refer to people in those races who are not Hispanic. Thus, our references to “whites” are references to non-Hispanic whites and our references to blacks are references to non-Hispanic blacks or African-Americans. The latest Census Bureau findings reveal that there are now 22 million Hispanic adults. A survey by the Pew Internet & American Life Project in February shows that half of them, or 11 million Hispanics, have Internet access. While this figure is still lower than the level of Internet access among whites, which now stands at 58%, it represents a striking story of the rapid penetration of a technology in this large population. In March 2000, the first month of survey work by the Pew Internet Project, 40% of Hispanic adults had Internet access. That means more than two million Hispanics came online in the 12 months ending in February 2001. Several factors stand out both as explanations for the continuing, though shrinking, divide between Hispanics and whites and as backdrop for this phenomenon of rapid growth in access. First, use of the Internet is still closely linked to socioeconomic factors. The higher a family’s income, the more likely members are to have access. Similarly, the higher a person’s education level, the more likely he is to go online. Overall, Hispanics lag behind whites economically and in educational attainment. The U.S. Census Bureau reported last year that the median household income of Hispanic Americans was $30,700 in 1999. This compares to $42,500 for whites, and $27,900 for African-American households. The Census Bureau said that 9% of Hispanics 18 and older had received a college or post-graduate degree. This is less than the 15% of African-Americans and the 26% of whites who have received the same degrees. Thus, a major part of the explanation for a continuing gap between access by whites and Hispanics can be traced to income and education levels. Despite these potential socioeconomic and cultural hindrances, the growth of the Hispanic Internet population in the past year has been impressive. In March 2000, the Pew Internet Project found that 40% of Hispanic Americans had ever gone online, and in February 2001 the rate was 50%. This 10-percentage-point increase in the Hispanic Internet population is part of a larger growth in the Internet population that includes more women, African-Americans, and those of modest means and education. Internet use by white adults has also grown strongly during the same period from 48% to 58%. The recent increase in the Hispanic Internet population is also shown by the fact that a quarter (24%) of Hispanic adult Internet users say they accessed the Internet for the first time in the past 12 months. About 14% of Hispanic Internet users first used the Web in the last six months. The proportion of newcomers in the Hispanic population who have come online in the past 12 months is similar to that of whites and somewhat smaller than the proportion of newcomers among African-Americans. Most Hispanic Internet users are fairly experienced – almost half (47%) first came online two to three years ago. Much like the trend in the African-American community, Hispanic women outnumber men as newbies to the online world. This is also in line with the general trend that women of all races predominate the new user population. In the past year, 26% of Hispanic female Internet users first accessed the Net. This compares to 21% of Hispanic male Internet users who first came online in the last year. The growth in the number of Hispanic women coming online during the year 2000 led to a 50-50 split between men and women in the Hispanic Internet population. This is similar to the overall online population, but is different from the situation with online African-Americans. Some 57% of black adults with Internet access are women. The online Hispanic population is very young compared to the African-American and the white Internet populations. This, in part, reflects the relative youth of the overall Hispanic population, which is also younger than the white and black populations. About 61% of online Hispanics are 34 or under. In comparison, about 37% of white Internet users and about 54% of African-American Internet users are in that age cohort. About 47% of white Internet users are between 35 and 54; about 40% of African-American Internet users are in that age bracket. By contrast, only a third (34%) of online Hispanics are middle-aged. While the Internet is starting to appeal to senior citizens, Hispanic seniors are lagging behind both their white and their African-American peers. Online Hispanics 55 or older constitute only 5% of the online Latino population, whereas whites that age make up 15% of the white Internet population, and African-Americans that age make up 6% of the black Internet population. The high proportion of young adults in the online Hispanic population also helps explain why so many Hispanics report that their first access came at school. About 30% of Hispanics said they first started using the Internet for reasons related to school. By comparison, only 15% of white Internet users, and 16% of African-American Internet users shared the same reasons. Meanwhile, 23% of Hispanics cited work reasons for their entrance into cyberspace, a rate lower than the 31% of white and the 43% of black Internet users. Another distinguishing aspect of the online Hispanic population is that many are parents who have children under the age of 18. Just under half (49%) of online Hispanics have a child at home. This is slightly less than the 51% of black Internet users who have children, but significantly more than the 41% of white Internet users who are parents. Hispanic parents, like other parents, often see the purchase of a computer and Internet access as an investment in their children’s future. In the past six months, new Hispanic Internet users have generally reflected some key trends in the growth of the overall online population. More women are coming online and new Internet users. Moreover, the newbies tend to have educational attainment less than a college degree and have more modest household incomes than the earliest adopters of the Internet. 52% of new Hispanic Internet users are women. 49% of new Hispanic Internet users live in households with incomes under $40,000 a year. Contrary to general Internet growth trends, which involve strong growth among older Americans at least into their 50s, new Hispanic Internet users are generally younger. A little over a third (34%) of new Hispanic Internet users are between the ages of 18 and 24. Another third (34%) are between the ages of 25-34. Hispanics older than 34 account for 32% of novice Internet users. This high growth among the young also helps explain why such a high proportion of online Hispanics do not have college degrees. Many are not yet old enough to have completed college. Of new Hispanic Internet users, 86% do not have a college degree – 44% have a high school diploma and 15% do not have a high school diploma. This new cohort has changed the character of the online Hispanic population, which several years ago was more likely to be made up of those with somewhat higher household incomes and college degrees. Many online minority households seem to be stretching themselves economically in order to get computers and Internet access. Of all the Hispanics who use the Internet, just under half (49%) live in households that earn less than $40,000 a year. About a third (33%) live in households that earn under between $40,000 and $75,000 a year, and 18% have incomes over $75,000 a year. This breakdown is similar to the African-American online population, but it differs in marked ways from the white online population. Some 26% of all Hispanic Internet users have college or graduate degrees. In comparison, 38% of online whites have a college or graduate degree. And 29% of black Internet users have a post-secondary degree. Online Hispanics are more likely than online whites to use the Internet as both a source of entertainment as well as a tool for economic and quality-of-life advancement. Our analysis is built around questions about Internet activities that are divided into four broad categories. The first category involves fun things to do online, such as playing games, listening to or downloading music, pursuing a hobby, and browsing the Net to while away the time. The second category involves use of the Internet as an “information utility” for such things as gathering product or financial information, getting news, seeking government information, and viewing weather reports. The third category involves use of the Internet for more essential life-enhancing activities, such as work-related research, and gathering information about health issues, new jobs, or new places to live. The final category involves using the Internet for financial transactions such as buying products, making travel reservations, performing online banking, or participating in online auctions. To make broad comparisons, we have used our polling sample from the year 2000, during which we interviewed 13,948 Internet users, 904 of whom are Hispanic. There is often noticeable variance among different ethnic and racial groups inside each category. Some differences between Hispanic and white Internet users are the following: 72% of online Hispanics have gone online “just for fun,” compared to 62% of white Internet users; almost half of online Hispanics (48%) have listened to music on the Web, while a third (33%) of online whites have done so; and more than a third (36%) of Hispanic Internet users have downloaded music, compared to 21% of online whites. Hispanics online also look for information about books, movies, and other leisure activities. About 71% of online Hispanics have sought this information, while 62% of whites have done so. And the appeal of multimedia activities has not escaped the attention of online Hispanics – about 50% have watched or listened to a video or audio clip while on the Web and just over a third (37%) have played a game online. In both instances, online Hispanics engage in these activities in greater proportions than online whites. In addition to using the Internet as a source of entertainment, Hispanics see the Internet as a tool for economic and personal advancement. Some 61% of online Hispanics have done school-related research or job training on the Internet; 51% have gotten health and medical information online; 50% have done work-related research; 41% have used the Web to look for a job; and 28% have used the Internet to gather information about a place to live. There are no clear ethnic and racial differences on other kinds of information gathering online. Nevertheless, it is important to note that while online, Hispanics have gotten news, sought financial information, researched a product, planned a vacation, checked the weather, gotten political news and information, and visited a government Web site in relatively similar proportions to online whites and blacks. On the other hand, whites with Internet access are more likely to look at financial information and check the weather. When it comes to transacting business on the Web, Hispanics have tried some activities in similar proportions to whites, including online banking (20% of online Hispanics have done that) and stock trading (12% have done that). At the same time, however, online whites are more likely than Hispanic Internet users to have purchased something online. Some 49% of online whites have done that, compared to 41% of Hispanics. White users also participate in online auctions at almost double the rate of online Hispanics. The Web has become an important part of many Hispanic Internet users’ daily lives. Our February 2001 survey shows that 61% of Hispanics are online on a typical day. 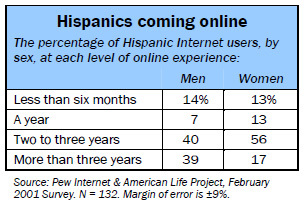 This is a 10-point jump (a 20% increase) from our March 2000 survey, which found that 51% of Hispanic Internet users went online on a typical day. Another way to look at Hispanics’ use of the Internet is to examine how frequently they say they use the Internet. Some 69% of online Hispanics revealed in our February 2001 survey they use the Internet at least once a day. Another 29% say they are online at least several times a week. In the overall Internet population, 60% of Internet users say they use the Internet at least once a day and another 32% say they use the Internet at least several times a week. Hispanics are embracing the Net with greater-than-average enthusiasm. The level of use of the Internet on a daily basis is often tied to a person’s experience and comfort with Internet tools. Newcomers of all kinds use the Internet less frequently than veterans and Hispanics are no exception. For example, 31% of new Hispanic Internet users (those with less than a year’s experience) report logging onto the Internet on a typical day; 36% of Internet users with about a year’s experience log on daily; 68% of those online for two to three years log on daily, and 72% of those who have more than three years experience go online daily. On a typical day on the Internet, online Hispanics are slightly less likely to be performing most Internet activities than whites and slightly more likely than African-Americans to be doing them. For instance, email is the most popular online activity for all groups. About 86% of Hispanic Internet users report having ever sent an email. But less than two-fifths of them (39%) do so on a typical day. In comparison, half (51%) of white Internet users send email on a typical day, and less than a third (32%) of black Internet users do so. Hispanic Internet users participate in some activities on a typical day more than whites and African-Americans, though. On any given day, online Hispanics are slightly more likely to research a product, make travel reservations, and play a game online. Hispanics are increasingly likely to have access to the Internet at home. Some 44% of Hispanic Internet users go online only from their homes, while 14% do so only from their workplace. A third (33%) log on from both places. This mirrors access by whites, of whom 46% only go online from their house, and 11% only go online from work. African-Americans are more likely than whites or Hispanics to have access only at work. On any given day on the Internet, some 54% of Hispanic Internet users are logging on from home, 23% are logging on only at work, and 16% are logging on in both places. This closely mirrors the daily pattern of white Internet users, 57% of whom logged from home “yesterday.” Again, African-Americans are more likely to have logged on at work, and 27% of online blacks do so on a typical day. Hispanics increased their home access to the Internet in the past year. Between March 2000 (the month the Pew Internet & American Life Project began polling Internet users) and December 2000, the proportion of Hispanic users who accessed the Internet from home grew from 61% to 75%. Hispanic Internet users resemble other Internet users when it comes to the time of day they use the Internet a typical day. Just under half (48%) of those who told us they used the Internet “yesterday” said they were online during working hours from 9 a.m. to 5 p.m. This is slightly less than the 52% of white and black Internet users who go online at the same time. Given their proclivity to use the Internet at home, Hispanics’ use is slightly higher than whites and blacks in the evening hours after work. About 45% of online Hispanics log on after 5 p.m. on a typical day, whereas 40% of black Internet users and 45% of white Internet users log on at the same time. Nearly a quarter (24%) of Hispanics log on in the early morning hours before 9 a.m. on a typical day. Hispanic men and women often have different preferences for the activities they pursue on the Internet. These gender differences are also found in the overall Internet population. Compared to Hispanic women who use the Internet, Hispanic men are more likely to go online looking for news, financial information, sports scores, and product information. For instance, 65% of online Hispanic men have gone online at some point to get news, whereas 56% of Hispanic women have done so. When it comes to researching products, the gap is even greater: 81% of Hispanic male Internet users have sought product information, while 63% of Hispanic women have done the same. Hispanic men are also much more likely than women to have used a multimedia clip online and to have surfed for information about their hobbies. On the other hand, Hispanic women are more likely than Hispanic male Internet users to log on for information that might enhance their job situation, living accommodations, or health. Like women from other groups, Hispanic women are interested in getting health information online – about 59% of Hispanic women have done so, compared to 42% of Hispanic men. On the less-serious side of life, Hispanic women are more likely to have played a game online (41%, compared to 34% for Hispanic men) and to have used instant messaging (55% for women, compared to 46% for men). When compared to other groups, Hispanic men have some favorite activities online. For instance, Hispanic men are more likely to have downloaded music from the Web than white men (38% to 25%), and are twice as likely to have done so on a typical day (9% to 4%). Online Hispanic men are also slightly more likely than white men to have searched the Web for information related to schoolwork or for job training (58% to 50%). Hispanic women also display some differences from women of other races when it comes to their activities online. For instance, Hispanic women have not embraced email on a daily basis as much as other women. About 38% of Hispanic women send or receive an email on a typical day, which is less than the 50% daily rate of email use by white women. Hispanic women are more likely to have gotten sports information online than other women. A third (33%) of online Hispanic women have ever done so, compared to 22% of white women and 28% of black women. Hispanic women with Internet access are more likely than online white women to have used the Internet for work-related or school-related research. About 65% of Hispanic women have used the Net to obtain information for school or their job, which is about the same as black women (67%), but is higher than the percentage of white women (52%) who have done so. Hispanic women also use the Web in greater proportions than white women to look for a job or a new place to live. On the other hand, Hispanic women have not embraced the Net for spiritual and religious guidance as other women have, especially African-American women. While about 18% of Hispanic women have sought such information online, 39% of African American women have done so; 23% of white women have done the same. The percentage of Internet users by race and gender engaging in online activities overall (and on a typical day). Much like their peers among whites and blacks, younger Hispanics under the age of 30 are drawn to the Internet’s entertainment activities and even more significant life-improving activities. On the other hand, older Hispanics, like older whites and African-Americans, are more likely than young Hispanics to have gone to a government Web site, booked a trip online, and sought information about health or medical issues. Just over three-quarters (78%) of Hispanic Internet users under the age of 30 have surfed the Net just for fun, compared to 67% of online Hispanics who are older. About 61% of younger Hispanics have sent instant messages, compared to 41% of older Hispanics who have done so. Just under half (46%) of younger Hispanics have gone into a chat room, but only 20% of older Hispanics have done the same. Younger Hispanic Internet users also love to listen to music online and download music files. In addition, 58% of younger Hispanics have played a video or audio clip on the Internet, while 45% of older Hispanics have done the same. Almost half of younger Hispanic Internet users (44%) have played a game online, while only 31% of their elders have done so. At the same time, younger Hispanic Internet users are more likely than those over 30 to engage in activities that help them advance their lives. Just over half (54%) have sought information about a new job online, while only 28% of older Hispanic Internet users have done so. Almost a third (32%) of younger Hispanic Internet users have looked for a new place to live, while less than a quarter (24%) of older Hispanic Internet users have done so. 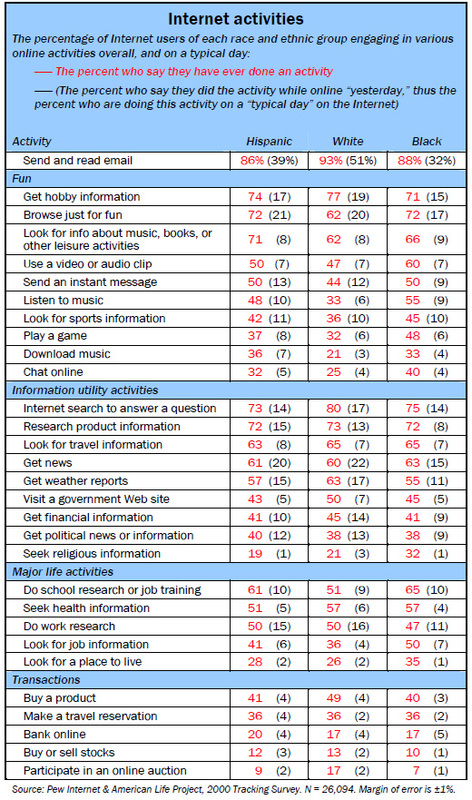 Younger Hispanic Internet users are also more likely to have sought hobby information than older Hispanics. However, there are other kinds of online activities that attract older Hispanics. More than half of online Hispanics over 30 (51%) have gone to government Web sites for information, compared with 35% of those under 30 who have done so. About 41% of older Hispanics have made travel reservations online, compared with 30% of younger Hispanics. Older online Hispanics are also more likely to have turned to the Internet for health information than younger Hispanics (55% to 46%). One interesting generational similarity is that both younger and older Hispanic Internet users have sought religious and spiritual information online in similar proportions (21% for younger Internet users, 19% for older ones). 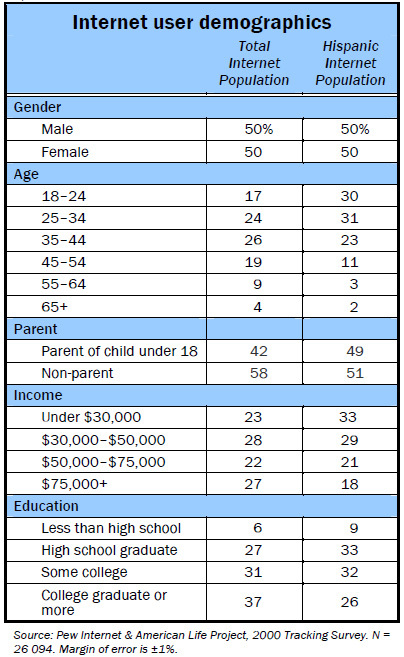 In the overall Internet population, older Internet users are much more likely than younger Internet users to seek this information online. Email is clearly the most popular activity on the Internet for almost everyone. Some 86% of Hispanics with Internet access have sent or received email at one point or another. That compares to 93% of online whites and 88% of online blacks who have used email. Just over half of Hispanic emailers (51%) say they would miss it a lot if they were to lose it. Online Hispanics say they are pleased with the ways in which email can bring them closer to family and friends. Some 86% of online Hispanics say that email is useful for communicating with family members, and 90% say it is useful for communicating with their friends. Just over half (53%) say that using email has prompted them to communicate more often with a key family member, and 56% say their relationship with a key friend has improved because of email. And 21% of Hispanics have used the Web or email to locate and reestablish contact with an old friend or a family member. Emailing family members is an important activity for Hispanic Internet users, 69% of whom use email to communicate with other family members. This is about 10 percentage points higher than African-Americans and 10 points lower than online whites who use email to communicate with their families. Hispanics with Internet access cite the speed of email communication as the main reason for using email to communicate with family members. White emailers appreciate the convenience factor a bit more. Online Hispanics are more likely to have used email to communicate with friends than with family members. Almost three quarters (74%) of Hispanics who use email say they employ e-communication to stay in touch with friends. That compares to 80% of email-using whites and 69% of email-using African-American who do that. Like many of those who use the Internet, Hispanics have found that it has improved their lives in some ways. Many appreciate how email has helped relationships with friends and family – 52% of Hispanics say it has helped their connections to family, while 58% say their connections to friends have improved because of their use of the Internet. The Web has also helped online Hispanics with other aspects of their lives. About 37% of online Hispanics say that using the Internet has improved their ability to shop – whether it is through more product information, lower prices, or something else. Another 41% say the Internet has improved their ability to get health and medical information – some 49% of online Hispanic women say that. Interestingly, 38% of Hispanic women say the Internet has helped them manage their finances, while 29% of male Hispanic Internet users agree. Online Hispanic men are more likely than women to say that the Internet has helped them pursue their hobbies. Our report entitled “Trust and Privacy Online: Why Americans Want to Rewrite the Rules” focused on the high level of concern among Americans about their privacy and the security of their personal information while they are online. The report was based on a survey taken in May and June 2000 and it found that online Hispanics’ concerns are very similar, generally falling between the views of online whites and online African-Americans. For instance, 64% of Hispanics with Internet access said they were very concerned about businesses and other people getting their personal information. In comparison, 68% of African-Americans and 56% of whites feel the same way. 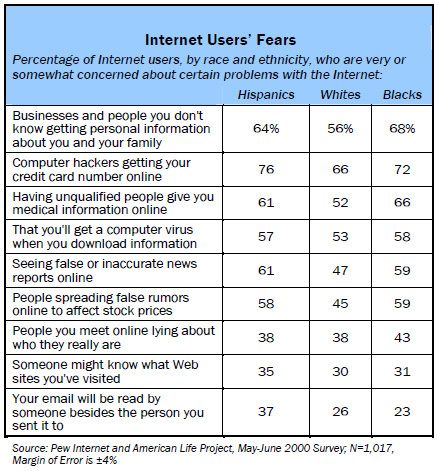 Hispanic Internet users, like African-American users, are much more wary of the Internet than whites. We found that large numbers of Hispanics are anxious about the bad things that can happen online. Almost half (49%) of Hispanic users are not confident that their online activities will remain private and will not be used without permission. That compares to 44% of white Internet users and 59% of online African-Americans who feel the same way. Like other Americans, Hispanics believe that online companies should ask for permission before firms disclose personal information about Internet users to others. Interestingly, though, Hispanics do not believe this as strongly as online blacks or whites. While fully 72% of Hispanic users believe that online companies should seek permission, 80% of online whites and 76% of online blacks feel the same way. When asked who is in the best position to set rules about how their privacy is protected online, 56% of Hispanics with Internet access said they themselves were the best equipped to establish the rules. Another 24% said the federal government should do it and 7% said Internet companies were in the best position to make the rules. Hispanic users are more likely to trust the government to protect their privacy than are white users and African-American users. On the flip side, white and black users are more likely than Hispanics to say that they can best protect their online privacy themselves. Online crime is a concern to many Hispanics – almost three-quarters of all Hispanics (70%) are very or somewhat worried about criminals using the Internet to engage in illegal activities. Almost half (48%) are very concerned about it. Even though many Hispanics expressed fears about their privacy online, many continued to do quite trusting things on the Internet such as purchase goods, obtain sensitive health information, or express interest in certain types of products and financial data. Our surveys show that 41% of Hispanics with Internet access have purchased something online – a figure equivalent to the 40% of blacks who have bought things online and less than the 49% of white users who have done the same. Another 72% of online Hispanics have used the Internet to get product information. One possible explanation for Hispanics’ willingness to participate in “trusting” activities online despite their privacy concerns, is that Hispanics, like most Internet users, do not know how they are tracked online. For example, only 36% of Hispanic users said they knew what a cookie is. Cookies are bits of computer code that Web sites, especially commercial ones, place inside users’ computers to track their movements through one, or sometimes multiple, Web sites. Cookies also allow Web site operators to know when a user’s computer has returned to the same site at another point in time. Thus, they allow companies to know how often people return to their site and what content is attractive to particular Internet users.